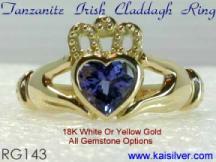 Gold wedding bands are available in many designs and prices. However, most jewellers lay complete emphasis on capturing mass markets with attractive prices. 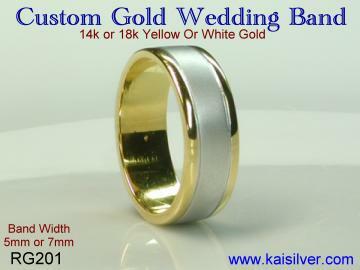 Kaisilver custom gold wedding bands have features that few other sellers would offer. Our well researched designs for wedding band rings give equal importance to good looks, good craftsmanship and long term durability. 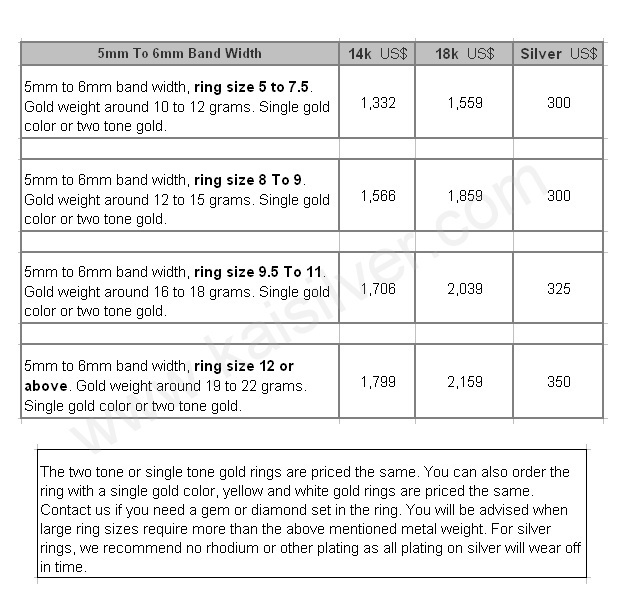 All wedding gold band rings can be ordered in 14k or 18k white or yellow gold and the two tone gold band option is available at no extra charge. As the world's largest online provider of highend custom jewelry we provide a high degree of customization and flexibility that no other jeweller can match. Gold wedding bands are one of the most popular type of wedding rings. Over the decades, numerous designs have been created for both yellow and white gold wedding rings, however not all wedding band gold rings are created the same. Most buyers look for just good looks and an attractive price tag. 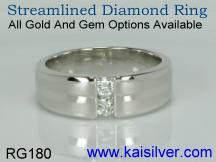 Sellers are aware of this and offer wedding bands that look good and have low gold weight. This does offer attractive prices but completely underplays the importance of long term durability of your gold wedding band ring. Your wedding ring is a special occassion ring and you will cherish it for the rest of your life. A low weight and haphazardly made gold wedding band will lead to frequent repairs and modifications and degrade the meaning and significance of a wedding ring. Do not let price be the main deciding factor when you shop for your wedding band ring. Make sure that the design, craftsmanship and gold weight of your wedding band ring will make it sturdy and durable. This plain gold wedding band is available as a 14k or 18k gold wedding band. You can choose a single gold color or a two tone gold option for your RG201 custom made wedding band. The ring is available in gold or 925 sterling silver and tailormade in all ring sizes. When you see the RG201 design on this page you might not immediately appreciate the efforts that have been put in to create the ring. Many of the features included in this gold wedding band would not even be noticeable, but they play a quiet supporting role in the background. The design is sleek and has no sharp edges, sharp edges in a wedding band ring tend to get scratched and chipped and this increases the rate of wear and tear of the ring. Your ring will not be mass produced and each ring is individually worked on by a team of skilled craftsmen and artisans. The individual attention provided to each ring allows us to customize the ring as per your requirements, thus opening up an unlimited range of options for you. 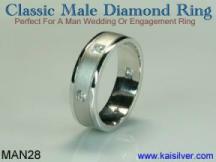 Email us your queries at sales@kaisilver.com and you will be provided with complete information by our team of experts. A sturdy and durable gold wedding band ring. The metal weight for the gold or 925 silver wedding band is porportional to the band width and the ring size. The smooth finish inside the band is perfect for engraving a message or symbols. You should spend some time reading the details of this wedding band ring. This will help you get a good idea of what you should expect from your gold wedding band rings. 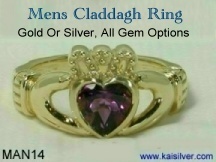 We will be happy if this information guides you into making a well informed decision and it really does not matter if the final order does not come to Kaisilver. (a) Thoroughly Studied Design: While we have considered market trends and buyer preferences, we have not joined the mad rush to gain market share by competing on price alone. This gold wedding band ring will look awesome in white or yellow gold. The rim on the top and bottom of this wedding band is ideally suited for a two tone wedding gold band ring. This design is simple and elegant and yet offers options that are bound to please everyone. If you decide to order this wedding band in a single gold color, you can choose to have the center portion of the band finished with a dull brushed look and have the rims done in high polish. The design will look equally gorgeous if the entire band is made with a dull finish or a high polish finish. (b) Healthy Gold Weight: The gold wedding bands that we make are made with you in mind. We do not run after mass markets and churn out light weight junk which need repairs and modifications every few months. The weight of your wedding gold band will depend on the width of the band and the size of the ring that you choose. 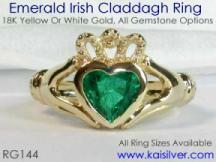 All Kaisilver jewelry typically weighs 50% to 60% more as compared to what others offer for similar designs. This adds to the longterm durability of the ring and also ensures that the gemstones and diamonds (if any) in the ring are firmly mounted. The good weight obviously means that we cannot compete in price to the other light weight wedding gold bands that flood the market, but it also means that your longterm interests are well looked after. (c) Premium Craftsmanship and Finishing: It is useless to have a gold wedding ring with a great design, good gold weight and cheap mass produced craftsmanship. 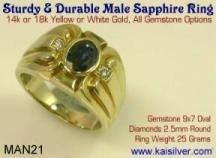 At Kaisilver some of the world's finest craftsmen work on all custom jewelry and we do not mass produce merchandise. Each detail on your wedding gold band is given complete attention and in the final phase of production flawless hand finishing is also provided. 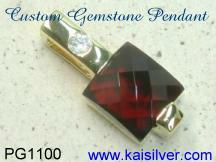 This high quality craftsmanship is time consuming, but is also the only way that high end jewelry can be made. (d) Suitable For Ladies And Men: The design of this gold wedding ring band is suitable for ladies and men. 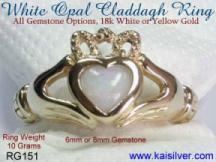 You can therefore get a stunning matching pair of wedding gold band rings at a modest price. It has become increasingly popular in recent times for a couple to wear wedding rings with the same design and the RG201 provides an excellent choice. 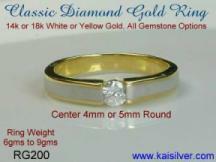 The men's gold wedding band can be made with a slightly boader band width as compared to the lady's. The weight of the gold band ring will be kept proportional to the width of the band and the size of the ring. (e) Complete Gold Options: You can choose from 14k or 18k yellow or white gold for your gold wedding band. 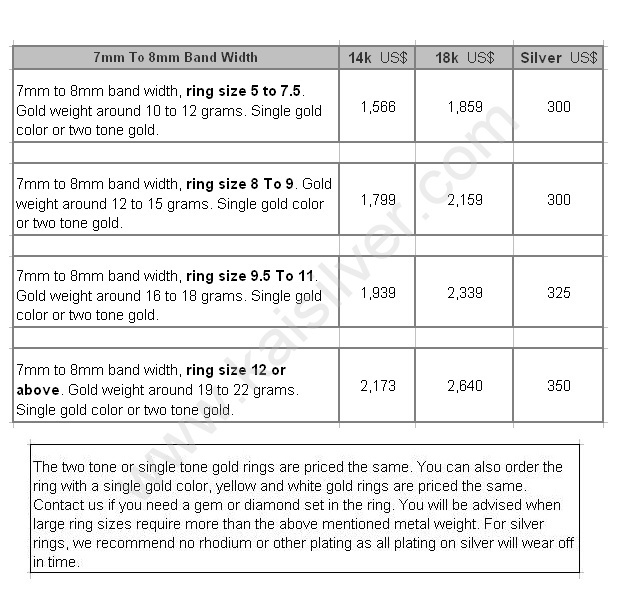 Besides the option for a white gold wedding band or a wedding band in yellow gold, we also provide you the two tone gold option at no extra charge. In the two tone gold option, yellow gold and white gold are combined in the same wedding band ring. 14k gold is much harder as compared to 18k gold and this makes your wedding band ring more durable and sturdy. We also provide 18k gold as an option but for large ring sizes 14k gold would be a better option, the final decision is always yours. (f) Complete Customization and Flexibility: Since each gold wedding band is completely custom made, we are in a position to cater to all your requirements and provide you with a high degree of flexibility that no other jeweller can match. You can choose to include a gemstone or diamond in your ring or even choose to order one of your own favourite designs. Email us your specific requirements or design images at sales@kaisilver.com and we will reply with suggestions and price quotes for the same. Customized gold wedding bands can also be ordered with an etching inside the band. The length of the message or name etched inside the band will depend on the band width and the size of the ring. This option is provided at no additional charge so you should consider choosing it. (g) Unlimited Gemstone and Diamond Choices: The wedding band gold ring shown here does not have any gemstones in the ring. However, you can choose to include one or more diamonds or gemstones in your wedding band. Let us know what you need and we will work out a price quote for you. 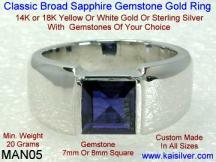 Kaisilver is directly networked to the world's largest sources for gemstones and diamonds. In many cases gems are procured directly from miners and it is unlikely that there is any gem stone that we cannot procure for you. This massive network gives us direct and preferential access to over 200 million carats of gem stones. 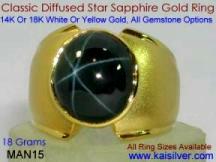 Let us know if you need a gem stone that is not mentioned on our website at sales@kaisilver.com and we will procure it for you. All gem stones are hand picked and custom cut by experts, you can therefore request for any fancy cut gem stone that you need. (h) Professional Advice: You would never find another source that allows you to do your shopping at your pace. Try to buy your gold wedding band rings from another jeweller and you will be pushed and coaxed into making a quick decision, even if it is not the right one. At Kaisilver a team of designers and craftsmen work on every query that is emailed to us, explanations are provided in simple non-technical terms. There is no selling pressure, simply because we do not hire any salesmen. We believe in providing buyers with complete information and then allowing them to make their own well informed decisions. This might seem like an old fashioned way to shop online for wedding band rings, but it is the way we prefer to build close relationships with buyers. 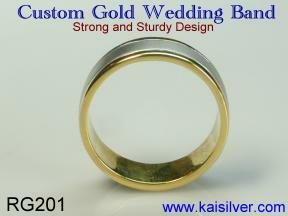 This gold wedding band ring is available in 2 band widths. If you need your wedding band ring to have a band width different than the options mentioned here, please email us with details and we will work together with you for final specifications and a price quote. 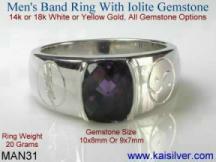 This band ring can be ordered with a band width of 5mm or 7mm. For the ring with band width of 5mm, the rim on either end of the band is 1mm and for the gold band ring with width of 7mm, the rim is 1.5mm on each side. Though the wedding gold band shown here has no gemstone or diamond set in the ring, you can choose to have diamonds and gemstones set in it. Email us your requirements at sales@kaisilver.com and we can discuss the various options available along with the cost of each option. The price of the ring will vary according to the type and size of gemstone or diamond selected. 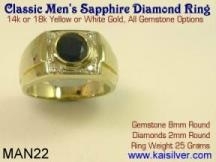 You can also let us know how many pieces of diamonds or other gemstone should be set in the ring. The weight of your gold wedding band ring will depend on the size of the ring and band width that you choose. In all cases we will ensure that your ring has a healthy gold weight which is the most important feature for making your ring sturdy and durable. The table below provides a clear indication of the weights that you can expect for various sizes of rings and varying band widths. We will let you know if your ring requires additional weight due to a large size or added band width. You can choose your wedding band from our exclusive collection of custom wedding bands. With an unlimited option to change or modify the designs and also send in images of your favourite wedding band designs, you are sure to find something that interests you. All rings can be ordered with diamonds or other gemstones and every design has been researched by our team of experts. Click for more wedding bands Every ring has high end craftsmanship and good gold weight. This provides added long term durability for your customized wedding band rings and reduces the need for frequent and expensive repairs. Do not be in a hurry to confirm and pay for your jewelry. Take your time to read and understand all details. If you have any further queries or doubts please email us at sales@kaisilver.com and we will be glad to clear all your doubts. It does not matter whether the final order comes to us or not. The only important thing is that you make a well informed decision and do not make an impulse purchase. This is the way that we prefer to do business as it helps us bring back the human touch to online selling. Shipping charges are 25 U.S$ and shipping will be within 4 to 5 weeks of order confirmation and receipt of payment. We need this time due to the immense amount of hand work involved in finishing each ring. 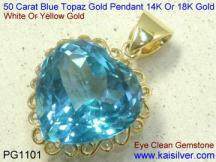 All gemstones and diamonds are hand picked by experts and every gemstone is custom cut by highly skilled craftsmen. 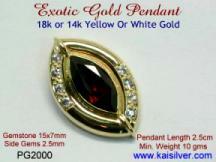 Kaisilver follows some of the strictest quality control standards and each jewel is a true high end masterpiece. Payment can be made through paypal to our email for paypal INFO@KAISILVER.COM and you can register for a free paypal account at www.paypal.com In recent months many buyers have complained regarding the huge amounts of information that paypal needs to open a new account. To handle this issue, we also accept payments through Western Union Money Transfer. The website provides information regarding Western Union Agents near you and also accepts online payments from few countries like U.S and U.K. You can visit the website at http://www.westernunion.com In most cases, your bank would also help you with Western Union Money Transfers. You could also make payments through International Money Orders In U.S$. Do let us know if you prefer Money Order or Western Union as a mode of payment and we will provide you with details for the same.